The past week or so has been met with a lot of concerning news for Amazon Sellers. This is, perhaps a direct opposite of the experience many in the miles and points community has experienced with the Chase Sapphire Reserve. You see, for one reason or another, Amazon is restricting brands. In fact, there’s a reddit post that lists many of the brands being restricted. The most concerning part is the fact that Amazon is requiring a non-refundable $1,000 payment. I get it. Amazon wants to ensure that you are committed to the brand. The problem is, that for many resellers, we can’t commit to just a few brands. Further, many resellers just can’t afford to pay $1,000 per brand, just to be able to sell products that we’ve been permitted to sell before. There have been numerous reports of brand owners like Birkenstock that have decided to stop selling on Amazon because of counterfeit products. Amazon isn’t saying that this is their attempt to get rid of counterfeit products, but, I really think it is. There are numerous articles about counterfeits on Amazon. It is one reason why I have advocated for folk’s doing non-commingled, when selling on Amazon. The sad part of this, however, is the fact that because Amazon’s own stock is commingled, they ultimately ship products, sold directly by Amazon, that are counterfeit. That said, this really hurts all sellers, not just the bad guys. Well, first of all, if you’re selling a product that Amazon restricts, you may not have recourse. I don’t have personal experience here, but if I saw a product, that I have a track record of selling, I’d submit a case to Amazon, demonstrating my history of selling the product, and asking for leniency. But I think what a lot of folks may be looking for, is how to not buy something that may eventually be restricted. I don’t have a crystal ball. I wish I did–I’d be able to predict airline devaluations, and more importantly, the hottest sellers on Amazon. That said, the easiest thing you can do, is to add products to your inventory before you buy them. You could go one step further, and create a shipping plan. We learned back in March, that Amazon was restricting what could be shipped in, because warehouses were just too full. I’m not sure that there is any good news here. Be vigilant when you buy anything. What I’m most concerned about, or, rather, curious about, is how this will impact Amazon’s bottom line. We have “Q4” – the time when many retailers finally get into the “Black” – aka, they get into profit (thus the name of Black Friday). If Amazon were to restrict its catalog, by, I’d say, restricting 40% of sellers, I have to believe that Amazon will see a drop in sales, and overall transactions. Will this drop result in a change of how Amazon interacts with its business partners (aka sellers)? One can only hope, however, there is a lot to be determined. Have you had a brand that you’ve sold before, suddenly become restricted? Did it require a $1,000 payment as well as receipts? I had that happen twice recently, with a certain brand of purses, and with a certain size (?) of a North Face jacket. For the jacket, luckily I had ordered 10 of them, 5 each in two sizes. The other size I listed and have shipped in all ready. But I copied, covered the prices, and scanned the receipt for all ten, which was the only criterion. No deposit. For the purses, it required 3 receipts, which I have as of last night, and will copy and send today. Again, no deposits. Really, as one who is literally a “professional seller” as this is my only business, I would rather there be some hoops to jump through for popular brands, so that the number of knock offs on Amazon drops. Read reviews of just about any product: steam mops, vacuums, clothing or accessories, and you will find angry consumers complaining about what is clearly an un licensed knockoff. 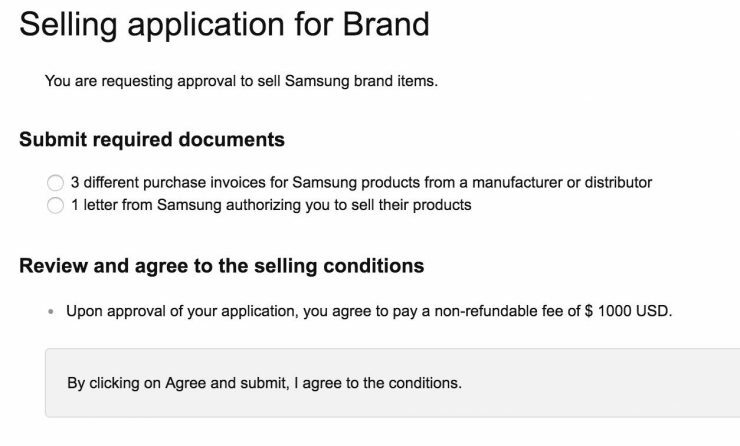 Absent the ridiculous fee for Samsung, the criteria do not seem to be onerous. And they point to being able to prove that you DO buy your stock from a trusted source. Luckily, I bought the North Face jackets on clearance from a national retail organization, and the purses from the manufacturer’s website. Not sure if, having bought them from bargainsareus.com, I’d get undated for them. Success at getting ungated is great! No disagreement that counterfeit products are a big problem.. But normally you can tell from a visual inspection – why not just train the folks receiving product, to you know, look at the product? Then they can side bar it for an investigation. Seems like then you’d catch sellers red-handed, rather than a global restriction. Training workers is expensive . If you pay workers to do one thing labor is cheap. If you are paying people to muktitask and to think… They are much pricier. I’ve been holding stuff to send in around Oct 1 for Christmas sales, but I’m getting them in now in case they get restricted. Thankfully the only toy I have that requires paperwork and a $1000 ungating bribe is an Elmo doll I bought entirely with Kohl’s Cash. But then I’ve also come across it with some non-Christmas items by PNY, Under Armour, Adidas kids. I’m sure I’m not the only one doing this, so good luck with that warehouse space issue, Amazon. MMKate – getting your inventory to Amazon early won’t necessarily get you around the new selling restrictions. I’ve seen posts from folks who have had their inventory moved to “unfillable” until they either successfully ungate or remove it. Yup, it has happened to me. They will restrict you from sending anything into the warehouse, and they will also “freeze” any existing inventory you have at the warehouse until they’ve approved you to sell that item. Honestly, if AZ wanted to eliminate the vast majority of counterfeit products they’d only be restricting Chinese sellers, as they are the ones flooding the market with fake stuff. How do you think the Chinese seller can undercut reputable sellers by more than half? Dark time for Amazon sellers, great time for Ebay buyers! Welcome to supply and demand sales! FBM sellers will have the hardest time. As an FBA seller Amazon has full control over your inventory and can inspect it at any time. This is good if you know your products are identical to the listings. Very bad if they are not. They are a lot more lenient with FBA sellers from my 9 years of Amazon selling experience, mostly FBM, now FBA. FBA or FBM, it doesn’t matter. They will restrict anyone whether they can inspect your inventory or not. And many FBA sellers are comingled, so they couldn’t check inventory even if they wanted to. has anyone had success in paying the 1000 bribe and getting ungated in a product? First and foremost, this is Amazon.com attempting to drive prices upward. @LA Gaz – I disagree completely. If anything, Amazon is just trying to ensure that customers get what they order. Every other action that Amazon has taken, leads me to believe that they want prices lower. They send out offers for fee reductions, if you reduce your price; they suppress the buy box if the price gets too high, etc.